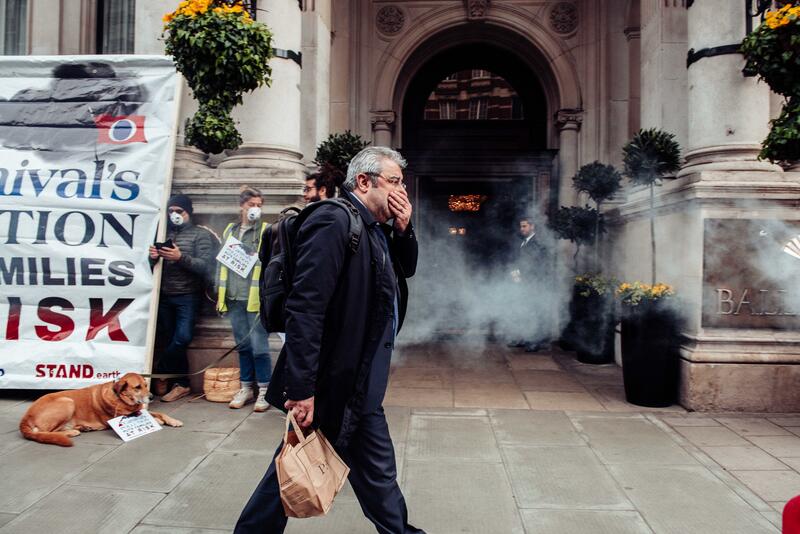 LONDON — As cruise ship giant Carnival Corporation held its annual general meeting (AGM) this morning at Mandarin Oriental Hyde Park in London, gas-mask wearing protesters welcomed shareholders with the somber message “Carnival pollutes” and called on the world’s largest cruise operator to switch from using ultra-dirty heavy fuel oil to cleaner fuels to power its global fleet. 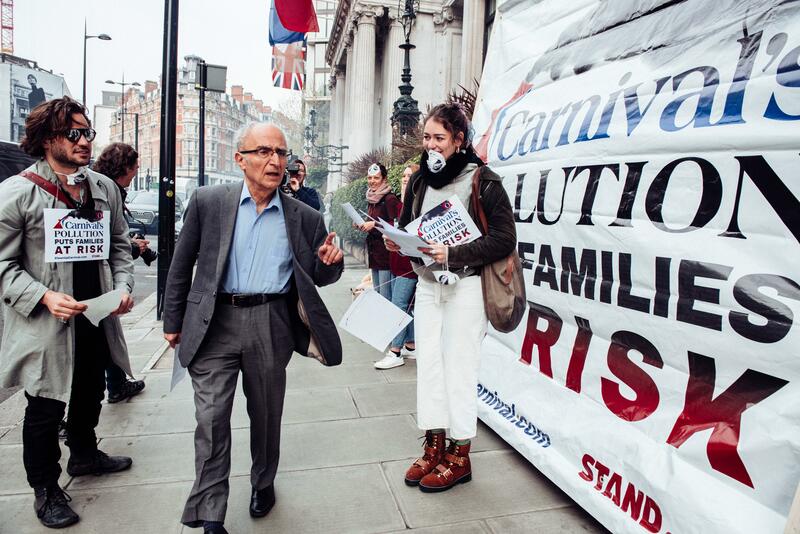 The activists, with international environmental organization Stand.earth, pointed to last week’s shocking revelations from the U.S. regarding Carnival Corporation’s engagement in recurring and pervasive criminal conduct and flouting of environmental regulations, and demanded the company and its shareholders take immediate action to clean up the company’s behavior. Environmental violations occurred across several Carnival Corporation brands, including those that frequent European, U.S., and Canadian waters — AIDA, Carnival Cruise Line, Costa, Cunard, Holland America, Princess, P&O Cruises UK, and Seabourn. Inside the AGM, retired mechanical engineer and former Ministry of Defense naval scientist Ralph Hardwick intervened to ask a question of Carnival Corporation’s executives. Hardwick, who was instrumental in stopping the expanded cruise terminal at London’s port in Greenwich, acted as legal proxy for Stand.earth staff who hold shares in the company. “How will Carnival Corporation address its gross failures on environmental stewardship and prevent further criminal prosecution? When will Carnival Corporation stop discharging toxic scrubber water into the ocean, and what steps will Carnival Corporation take to phase fossil fuels out of its global fleet?” asked Hardwick. Outside the meeting, protestors gathered along the sidewalk, wearing gas masks printed with the words “Carnival pollutes.” Nearby stood a large sign with the words “Carnival pollution puts families at risk” while a cruise ship sculpture belched “smoke” — visceral reminders of the pollution emitted from cruise ship funnels as a result of the burning of the dirtiest fossil fuel available for marine transportation — heavy fuel oil. An undercover investigation published earlier this year by a Johns Hopkins Bloomberg School of Public Health professor revealed that air quality on Carnival Corporation cruise ships can be worse than some of the world’s most polluted cities. Stand.earth is calling on Carnival Corporation to move its global fleet away from heavy fuel oil to cleaner-burning marine gas oil with pollution filters, and to ultimately transition away from fossil-fuel powered ships completely. “As long as heavy fuel oil is on board cruise ships, there is a temptation to use it — even where it’s prohibited. We saw this last year in France, when yet another Carnival Corporation ship was convicted of criminal environmental violations. Carnival Corporation’s track record shows a company doing everything it can to save money at the expense of the climate, our oceans, and public health — including breaking the law and trying to cover it up. Our lungs, our waters, and our air are not trash receptacles for Carnival’s toxic pollution,” said Kendra Ulrich, Senior Shipping Campaigner at Stand.earth. In 2020, the International Maritime Organization will ban the shipping industry from burning high-sulfur fuels like heavy fuel oil. But the ban includes a loophole to allow the continued use of these fuels if ships install open-loop scrubbers, systems designed to remove pollution from air and discharge it into water. Carnival Corporation is doubling down on open-loop scrubbers, aiming to install them on its entire global fleet by 2020. Open-loop scrubbers are unreliable for pollution control, with dozens of failures documented across multiple Carnival brands, as reported by the U.S. court in charge of the company’s ongoing criminal case.